Last weekend I ran the Howl Rising 5k at Angel Mounds, literally five minutes from my house. Even though it's a state historic site, the majority of the trails are open to the public and I run them sometimes since it's literally a mile from my house. This 5k was part of a series called Howl at the Moon, where you could run a night time 5 or 50k the night before then run a 5, 10 or 15k or half marathon the next morning. Even though I'm not a big fan of trails, I had been debating running the series because it's so close, the entry fees were super cheap and they're trails I run semi-frequently. Unfortunately the night time race got cancelled because of all the rain and flooding we've had recently. I had ran over there right before the Peace, Run and Harmony Half and several of the trails were super muddy and/or underwater so I completely understood why! I wasn't expecting much out of this race because you usually run trails slower than your road pace, it was super hot and humid at 7AM and I figured we would be slogging through the mud. I decided I wasn't going to look at my watch the entire race and felt like I was going super slow. But I was pleasantly surprised when I finished in 39:12 with a 12:37 per mile pace. And it was super awesome to roll out of bed at 6AM, feed Cameron, get ready and show up for the race 10 minutes before start since I live so close. I might investigate more races there in the future! This guy turned ONE YEAR OLD on Friday. If I'm completely honest, it was a bittersweet day for me. He's my last baby, so it was my last first birthday. Not only that, but his birth was really rough so that was on my mind as well. Add to it that we should've been celebrating two babies and let's just say that there were some tears leading up to and including the day. Not to mention that Cecily had a rough day because it wasn't her birthday. I tried really hard to focus on getting ready for his party and focus on spending the day with my super happy kid. We had a chill day and celebrated with some cupcakes we had gotten once Alan and Ewan came home from Cub Scout camp. I said this about Cecily but he might also be my destructive, rough and tumble kid too. He loves to just crawl right through and over things and probably his favorite thing to do right now is throw and bang on things. He's currently cutting all four one year molars and nursing is suffering as a result. Considering I wasn't sure I was going to make it to six months when he was born I'll take getting to a year. He also says Mama and up and I'm pretty sure I've heard him say more a couple times, when he's eating. Speaking of eating, this kid is a disposal. He LOVES food. 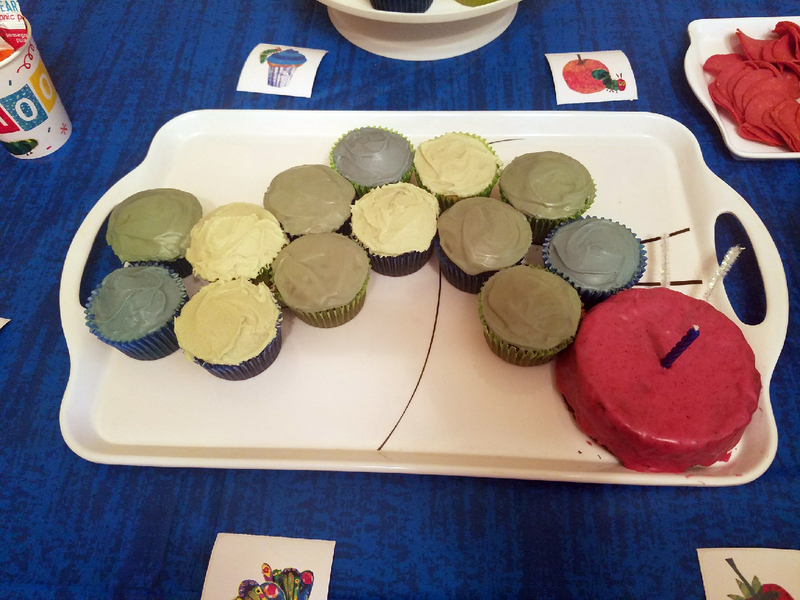 As such, his birthday theme was A Very Hungry Cameron aka The Very Hungry Caterpillar. We just had a small party with family and a few close friends. It was super simple to do too. I made the caterpillar cake out of cupcakes and the head was Cam's smash cake. All the food was food from the book. It was a great time all around and it was so nice not to be super stressed out and fighting with Alan before the party, which is what always happens when we have a party at our house. I'm so glad everything turned out well. Happy First Birthday my sweet little man!